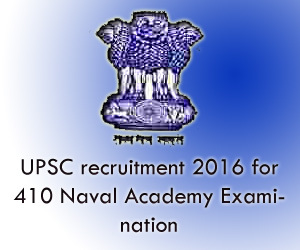 UPSC recruitment 2016 for 410 Naval Academy Examination posts apply: Union Public service commission (UPSC) officially announced notification to recruit 410 national Defense academy and naval academy examination (II) 2016 vacancies, Those who are the job seekers looking for govt jobs in up 2016 this is the best opportunity to apply. Candidates read the upsc official notification then read all the instructions and prospectors carefully then apply before the last date online application received. Discipline - Vacancies: Career in upsc invites application to fill the 410 national Defense academy and naval academy examination (II) 2016 positions on various designation departments. Appliers who are completed the +2 class they are eligibility for this notification,. more details check all the Syllabus, Exam Date, Hall Ticker, Admit card and results will be updates in official website. Number of Posts Total Issued: national Defense academy and naval academy examination (II) 2016. Applier Age Limit: Applicant Not born earlier than 2nd Jan 1998 and not later then 1st Jan 2001 and Age Relaxation communities for 5 years for st/sc candidates, 3 years for obc candidates. Selection Process: basis of written examination and personal interview. Application Details: pay application fee Rs 100/- either by depositing the money in any branch of state bank of India by cash or by using net banking facility of the state bank of India or by using visa/master credit/debit card. (SC) / Schedule tribe categories candidates (ST)/Physically Handicapped (PH)/Women are exempted from application fee. How to Apply this Opening Vacancies: apply online through official website of Union Public service commission UPSC www.upsconline.nic.in. Last date for the application form received 15th July 2016.